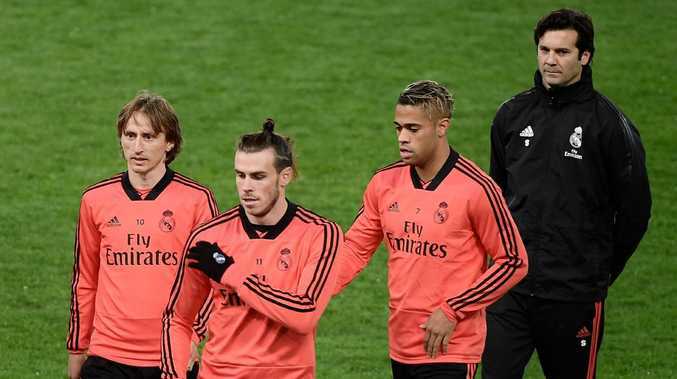 Real Madrid and Bayern Munich return to the Champions League on Tuesday in crisis mode after the latest setbacks in their domestic leagues. Madrid, the three-time European defending champion, was humiliated 3-0 by Eibar in Spain on Saturday. The first defeat for new coach Santiago Solari renews debate over his team's ability to challenge for honors in its first season without Cristiano Ronaldo in nearly a decade. Solari, who started with four wins after replacing the fired Julen Lopetegui, next faces a stern test at Roma. Bayern, which appeared without a serious rival as it clocked up six consecutive Bundesliga titles, is suddenly vulnerable in Niko Kovac's first season in charge. Bayern was held to a 3-3 draw at home by promoted Fortuna Duesseldorf - a relegation candidate - on Saturday, and is already well behind resurgent Borussia Dortmund. A seventh straight title is appearing increasingly unlikely. Kovac has a point to prove when his team hosts Benfica, though a draw will be enough to ensure progress to the next round. Bayern seems to be a shadow of its former self after twice letting a two-goal lead slip against Duesseldorf. Kovac's position is under threat unless he can coax the side into the kind of performances it delivered at the start of the season, when it scored 19 goals in its opening seven games - all victories - including the German Supercup win over Eintracht Frankfurt. Bayern president Uli Hoeness, who previously said he would defend Kovac "to the hilt," appears to have changed his tune after saying Saturday that club officials would sit down after Benfica's visit to see "how things should continue." Bayern, which leads Group E with 10 points from four games, would top the group with a win over Benfica if Ajax, on eight points, fails to beat AEK Athens away in the earlier game. Benfica, on four points, needs to beat Bayern to maintain any hope of a top-two finish. 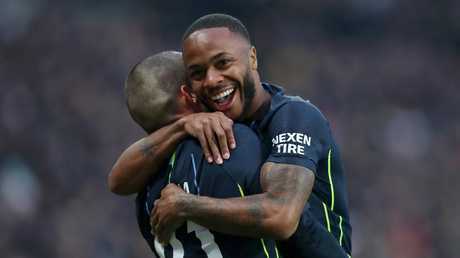 Manchester City can qualify for the knockout stage with a draw in Lyon and is aiming to avenge a 2-1 loss at home to the French team, its only loss so far in any competition this season. Lyon's confidence-building 1-0 derby win over Saint-Etienne last Friday showed both the good and bad sides of Bruno Genesio's inconsistent team. City coach Pep Guardiola will have noted that Saint-Etienne repeatedly breached Lyon's lines and would have won without first-half saves from Anthony Lopes. City has recovered well in Group F since that initial loss to Lyon, winning three straight games - scoring 11 goals - to move three points clear. A win in France would clinch top spot. Lyon would be through with a win. Hoffenheim hosts Shakhtar Donetsk in the other group game. Madrid's early season troubles are back after the demoralizing loss to Eibar. The team's attack is under scrutiny after failing to make up for Ronaldo's departure for Juventus, while its defense is among the worst in Spain. Madrid has already conceded 19 goals in 13 Spanish league matches. Madrid and Roma are level on nine points and seem assured of progress from Group G. The Italian club will be through with a draw, or if CSKA Moscow fails to beat Plzen in the earlier group game. Roma will need to bounce back swiftly from Saturday's loss at Udinese. The 1-0 defeat was the third time this season Roma has lost to a team near the bottom of the standings. Captain Daniele De Rossi is out with a knee injury and forward Diego Perotti is also sidelined, but coach Eusebio Di Francesco is hoping to welcome back Kostas Manolas after the Greek defender injured his ankle on international duty. Group leader Juventus hosts Valencia and will be through with a draw or if Manchester United loses at home to Young Boys. United coach Jose Mourinho is again under pressure after poor results. 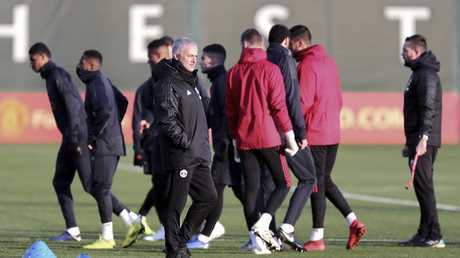 Since beating Juventus 2-1 in Turin, United has been taken apart in the Manchester derby by fierce rival City and then, in its first game back after the international break, held to a lackluster 0-0 home draw by Crystal Palace in the Premier League. United heads into Tuesday's game in second place in the group, two points behind Juventus and two clear of Valencia. Valencia, which will be out of contention if it doesn't win and United does, will be wary of an even more motivated Cristiano Ronaldo. The Juventus forward is still smarting from his sending off against Valencia in September - his first ever red card in the Champions League. Ronaldo is the all-time leading scorer in the Champions League with 121 goals, and got off the mark for Juventus in the competition last time out. Valencia appears to have finally put its struggles in the past. After winning only one of its first 13 matches, the Spanish club has won four of its last five games in all competitions. The 22-year-old striker Santi Mina has been key for Valencia recently, having scored six goals in his last five matches.